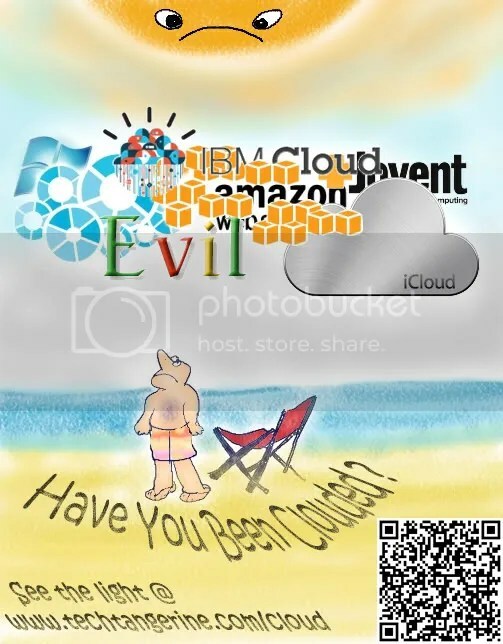 This graphic is an addition to one of the more popular articles on this website, Ten Reasons Why Cloud Computing is a Bad Idea. Feel free to use it and reproduce it. A printout on an office/cubicle notice board can be fairly effective in spreading awareness on the subject. Please click on the image or click here to download a high quality version of the below image, complete with a link and a QR code for mobile phones. Please shop at our store to keep this website and its contents online. Have You Been Clouded? by Hamad Subani / Techtangerine.com is licensed under a Creative Commons Attribution-NoDerivs 3.0 Unported License. Permissions beyond the scope of this license may be available at http://www.techtangerine.com/2011/11/06/have-you-been-clouded. Previous story Who killed Encyclopaedia Dramatica?